At St. Stephen’s we believe that our faith directs us to be good stewards of the earth, and we have long worked to reduce the impacts that our lives and worship have on the creation God has given us. 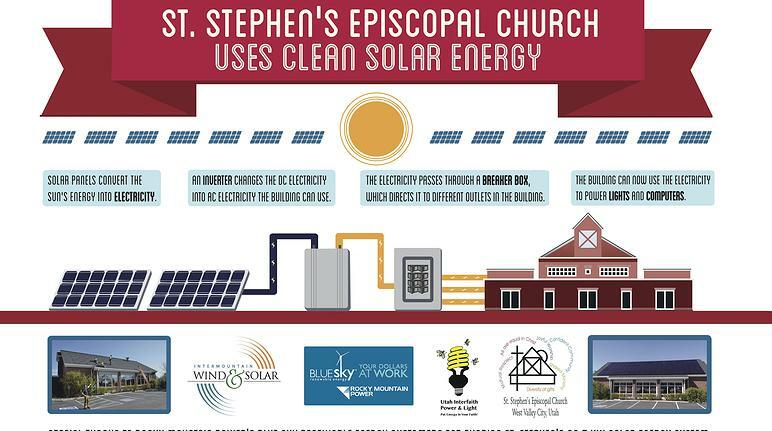 St. Stephen’s Episcopal Church is grateful to God, the generosity of our partners, and the financial contributions of our members for the gift of solar panels! We have an array of 76 micro-inverters with a total capacity of 20.52 kilowatts. We expect this array to provide a total of approximately 30,000 kW a year, which will reduce our carbon footprint and impact on creation by 50%! This project was funded by grants, for which we are deeply grateful. We received a $65,000 grant from the Blue Sky Program of Rocky Mountain power, along with a $2,500 grant from Utah Interfaith Power and Light. Funding from our parishioners provided about 10% of the funds. We thank our granting partners for their generosity. St. Stephen’s was one of 10 churches awarded grants this year, including also St. James in Midvale and St. Luke’s in Park City!